Here are the basics: Sena’s Apple Watch stand is going to hit Apple Stores in mid-November, and it will sell for $79.95, although you can snag a $10 discount if you preorder at the website. 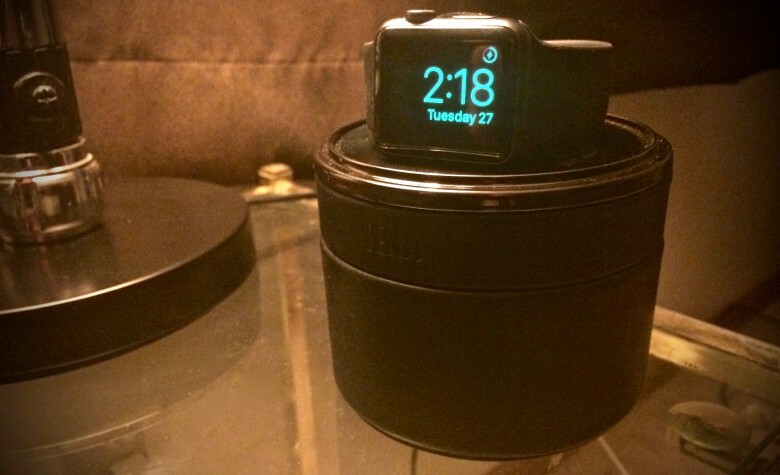 What that gets you is the leather case with a microsuede platform to cradle your Apple Watch upon. It has a hole that will securely hold your charging puck, and the cable winds around inside the stand before heading out to the outlet. And that’s the feature I love the most about this thing: I have the 2-meter charging cable for my watch, and I was often tripping over it or just kicking it around. Or it would snag on something and disconnect mid-charge. But mostly, it just looked bad. It was great being able to wind the excess cord and hide it away so it didn’t bother me anymore. Somewhat related to that first issue was the fact that I was always bumping my nightstand in my sleep and sending my Apple Watch tumbling to the floor or into the trash. Sometimes it would unplug on the way, and sometimes it wouldn’t, but either situation is annoying first thing in the morning. You can securely fasten your Apple Watch to the Sena stand. You do the same with any stand, really; this is more an endorsement of the things in general. But I haven’t bumped the Watch off in the past week, and that’s a record for me. Sena also includes a feature I can’t imagine ever using. You can wind the cord completely inside the case, then fit the base over the top and carry your Apple Watch inside for travel. It holds tight with hidden magnets, and that’s cool, but if I’m traveling, I’m pretty sure I’m going to be wearing the watch. It’s cool for cord storage, and I appreciate that the thing is highly portable, but unless you’re the kind of person who owns multiple Apple Watches — and maybe you are if you’re willing to spend up to $80 for something you could build out of Lego bricks — you won’t have any reason to stow your wearable in there. So while I do really like Sena’s case, it’s hard to recommend a purchase. It’s gorgeous, and it’s handy to have around, but I don’t know if I’d miss it if it were gone. Sena provided Cult of Mac a free unit for this review.